Lots to read online? Stick it in your “Pocket” (and get to it later). Do you have too much to read and not enough time? 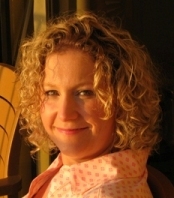 Do you stumble onto great content via Pinterest, Facebook or Twitter on your smartphone or tablet then lose track of it? Are your bookmarks scattered across multiple devices and hard to manage? I had the same annoying problem and then I found Pocket! I stumbled onto a mention of Pocket on Twitter the other day and instantly knew that I had to try it. 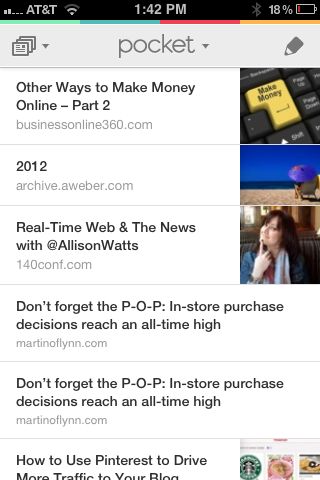 Pocket is a place where you can save any online content to read or view later. I love to read and I am constantly finding things that I want to explore at a later time. I find myself bookmarking things here on my iPhone, there on my Kindle Fire and also on my PC … sometimes in Internet Explorer and sometimes in Firefox. Or, in the past, I saw something at work and would email the link to myself at home. So, when I saw this idea for Pocket, I was excited to (finally!) put all of my stuff in one place. I tried it out for myself and here is my review. There is a small amount of prep work to get started. The first thing that I did was to sign-up for an easy and free Pocket account. Next, I had to figure out how to save things to Pocket (you can save content via your browser, via email, via apps that you might already use, like Twitter for iPhone, via the iPhone or iPad bookmarklet or via apps for Android and Kindle Fire). Even with multiple devices on different platforms, it was quick and easy. I dragged and dropped the button to my browser on my computer. I downloaded the app to my iPhone and the app to my Kindle Fire (both were free). Although I could simply email content from my iPhone to pocket, I also installed the iPhone bookmarklet with some simple instructions. After that, I was good to go. Let’s talk about saving to Pocket. I had two concerns there. First, as I mentioned before, I need to be able to pocket from anywhere. I use both my iPhone and my Kindle Fire (which is basically a tricked-out Android tablet) and bring both with me everywhere and use them both a lot. Second, I need to be able to pocket content from social media outlets like Twitter, Pinterest, LinkedIn and Facebook and also from blogs and other websites. No problem-o. I have saved content reliably over the last week from all of my devices, from all kinds of sources, over both wifi and 3G with no issues. Pocketing via Twitter is especially elegant because Twitter has added the Pocket functionality into its app. On my iPhone, the Twitter app lets me pocket with just a finger swipe; select “share” and then select the “Read Later” option. On my Kindle Fire, do the same thing; right swipe, select “share” and select the “Add to Pocket” option. In your web browser, follow the link to the content and click the “+Pocket” button in your bookmarks toolbar. Super simple. Pocketing via a Web browser is also easy. On my Kindle Fire, I simply select “Share Page” and then click “Add to Pocket.” On my iPhone, I can pocket 2 ways: I can click the “share” icon and then click “Mail Link to this Page.” Type in “add@getpocket.com” and click “send.” If you install the bookmarklet, you can also click the bookmarks icon and select “Save to Pocket.” Either way works fine and is straightforward. Would I be able to read the stuff in my Pocket from and and all of my devices? Would I be able to update my content seamlessly on any device, anytime I wanted? Could I read my Pocket content if I didn’t have wifi access? Yes, yes and yes! No matter what I added, when I added it or from which device I added it, my Pocket was consistent (and believe me, I tried to trip Pocket up). I love that I can read Pocket content without wifi access from my Kindle Fire, too. Another interesting feature is that you can organize your content in your Pocket using tags, similar to how many bloggers organize their posts. This could be very useful as you build up your Pocket content. I would wholeheartedly recommend Pocket because Pocket solves a real problem for me … keeping a bunch of unrelated, web-based content stored in one central location and making it easily accessible and storable across the various devices that I have and use. It is easy to use and easy to set-up. There are some other features of Pocket like archiving and viewing options that I haven’t covered here so I encourage you to try it out for yourself. Pocket has a very good support portal as well, if you have questions. Have you tried Pocket? What did you think? I’d love to read your thoughts and suggestions below :-). An outstanding share! I’ve just forwarded this onto a co-worker who was conducting a little research on this. And he in fact ordered me breakfast simply because I found it for him… lol. So allow me to reword this…. Thanks for the meal!! But yeah, thanks for spending the time to discuss this subject here on your web site.